BlackBerry bulk SMS Software is simple to operate application that conveniently sends multiple numbers of text messages from PC via blackberry mobile phones. Bulk SMS software is the cost-effective method to communicate with friends, relatives, friends and customers. Bulk text messaging software allows you to send bulk text messages directly from computer without internet connection required. Bulk text SMS sending program is comprehensive mobile marketing application that helps you to market your products and services via sending bulk text messages. Connect with your customers at any time via broadcasting bulk text messages. Send personalized SMS, product promotion campaign, event notification, reminders, job alert and much more. Make your product social and attract more customers to your business. 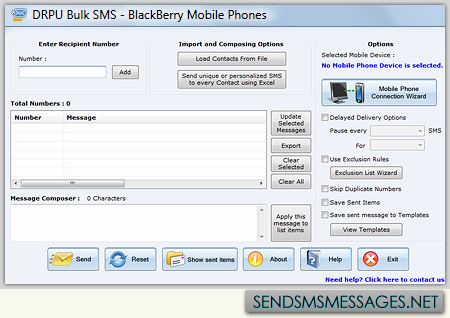 Empowers users to send bulk numbers of text messages via blackberry mobiles connected with computer. Does not require internet connection to send multiple numbers of text messages. Supports all Unicode languages to send bulk SMS in any text format. Provides inbuilt list wizard option to maintain the list of contacts or groups. Enables user to use templates with option to add template or edit existing template. Provides facility to skip duplicate number entries during the messages sending process. Offers delay delivery option to manage the load of bulk SMS broadcasting. Blackberry SMS sender software trial version is available to examine features and working capabilities. Place order to get full featured software licensed version at cost-effective price.